Century College is the largest community college in Minnesota, serving over 15,000 students with more than 40 career programs. Located north of the twin cities in White Bear Lake, it is also the state’s largest provider of technical training, serving another 10,000 students. About 13% of Century’s courses are offered fully online or in a blended online and classroom learning format. 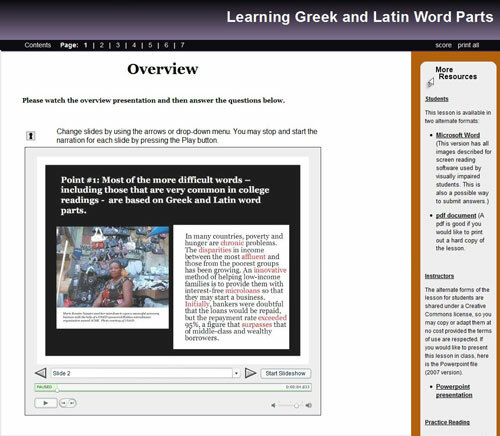 When the college first offered online courses nearly a decade ago, lessons were primarily text based. Faculty loaded Microsoft Word documents and PDFs into Desire2Learn, the Learning Management System used by Century. Like many early e-learning initiatives, the system proved less than engaging to students. The college took a big step forward in 2009 when faculty in the Reading program wrote a grant that enabled them to purchase six licenses from SoftChalk, the maker of content authoring software. Licenses were used in the Reading Lab and by Reading faculty. The difference was remarkable. With SoftChalk, faculty found they could easily create multimedia courses with features they never dreamed of before. In minutes they could mash up their own materials with rich media (video, audio, images), and create interactive exercises, quizzes and text. It was easy to add supplemental material and drag and resize images – and SoftChalk ensured that lessons met accessibility standards. Faculty from the Reading program presented SoftChalk to other programs on campus. By 2011 faculty members in more than a dozen programs and departments across campus, from nursing and dental hygiene to biology, chemistry and interior design, were using SoftChalk. Content within screen capture authored by Alexandra Crittenden of Century College. Student focus groups revealed that students overwhelmingly liked the SoftChalk interface, content presentation, ease of use and interactivity. While a formal study has not been done, Kelly says there is already anecdotal evidence that SoftChalk improves student outcomes. Kelly also notes that the SoftChalk-created lessons provide a quality of content presentation that is not available in a learning management system, adding value to its Desire2Learn LMS. In February 2012, Century rolled out campus-wide implementation and has established SoftChalk training sessions. “We expect the number of users to grow quickly now that we have made it more accessible across campus,” Kelly says.